What Is the PentaHex Gaming Platform? 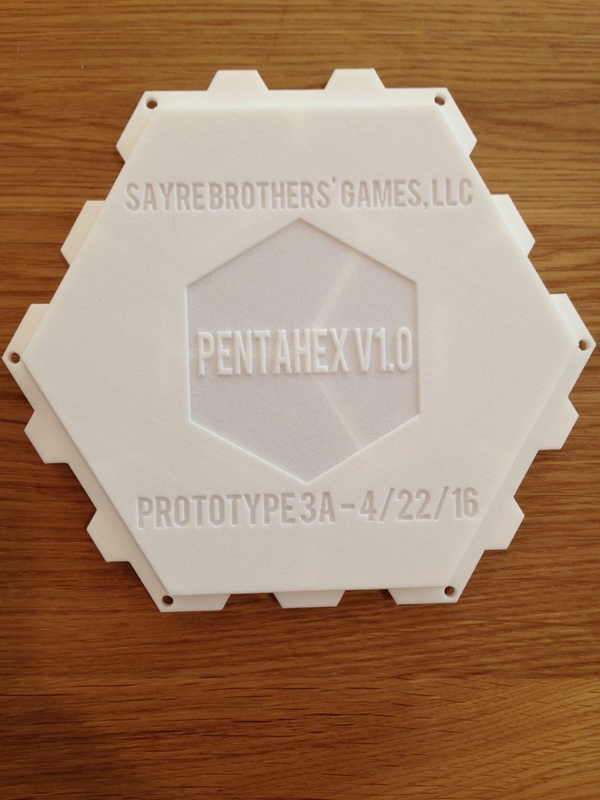 We’re excited to announce Sayre Brothers’ Games first product — the PentaHex Gaming Platform. Already a number of people have had questions about PentaHex. So we’ve created this page to provide an exhaustive overview of our vision to date. Is this a Game Board or a Board Game? A board game is nothing without its game board. For all PentaHex-based games, the playing surface is made up of interlocking PentaHex Board Units (PBUs). You use PBUs to assemble a given game’s playing surface — the game board. PentaHex Prototype 3 with laser-cut game pieces. The concept behind the individual game board units (PBUs) is to allow players and game designers to use as many or as few of them as they want to create the world — the playing surface — they envision for their games. How a given game board is assembled (the number of PBUs and overall shape of the board) is determined by the goals and rules of the game. How each PBU is populated with game pieces, whether a game utilizes all nine cells of each PBU or groups cells into larger polygons, and how players move within PBUs and between PBUs is all part of the gaming dynamics. But the PentaHex Gaming Platform is more than a game board or a board game! The PentaHex Gaming Platform will be a four-part system. We’ve provided more detail below about each part. Part One consists of the individual PentaHex Board Units (PBUs). These are the game board units which are assembled into whatever configuration is required to play your tabletop board game. Our standard PentaHex boxset will ship with 24 PBUs, just enough to play the two complete games we’ve created (see part 3) and more than enough for designing your own tabletop board game world (see part 4). If you want a larger playing surface, you just add more PBUs by buying an expansion pack (details coming later). 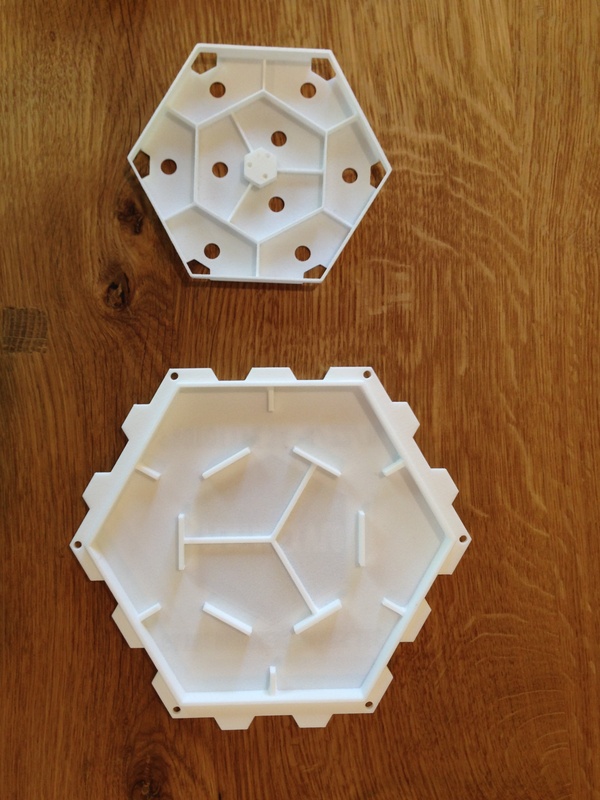 See this post to learn more about the PentaHex prototypes. Part Two consists of the various PentaHex Game Pieces (PGPs) that ship with the standard PentaHex game boxset. These are integral to a given game’s play and come in several standard polygonal shapes of varying colors. 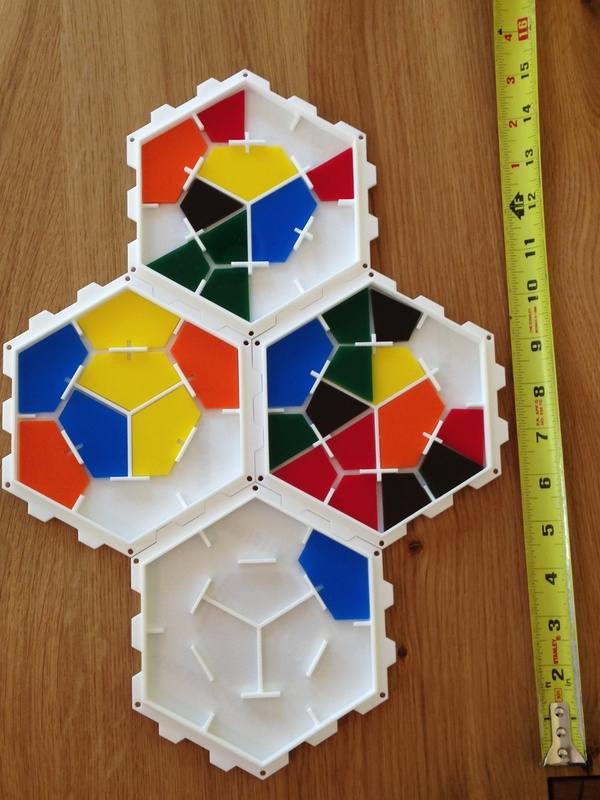 Other PentaHex-based games may offer different game pieces based on the geometry of the PBU. Each PBU has nine (9) pentagonal wells — six along the outer perimeter, and three within the inner hexagon. 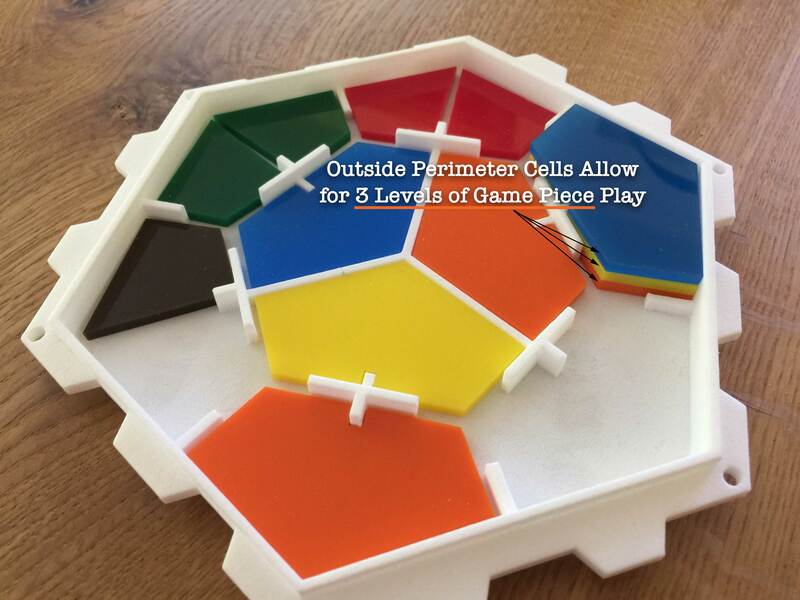 Each of the wells (also called cells) of the 6 outer pentagons allow for up to three (3) levels of play. The inner three pentagons allow for two (2) levels of play. That means a fully populated PBU can contain as many as 24 standard PentaHex Game Pieces (PGPs). The standard PentaHex boxset will ship with over 500 PGPs! Part Three consists of the two unique and complete games that ship with the standard game boxset. These games are designed to offer fun and exciting game play right out of the box. They are also a small glimpse of what is possible with the PentaHex Gaming Platform. Our first game is currently in development. It’s called, The Epochs of Errimel: A Three-part Civilization Adventure! 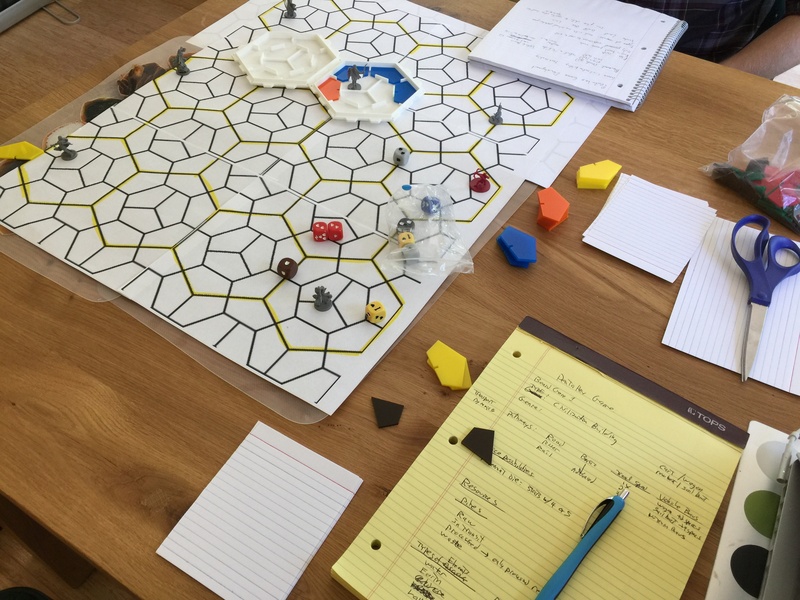 Please go read that post as we’ve provided a brief video of the first day of game world creation for our very first board game that uses the PentaHex Gaming Platform. Part Four consists of the PentaHex Worlds Creation Manual. It’s an information-packed manual to help game creators design and sell their own PentaHex-based board games. 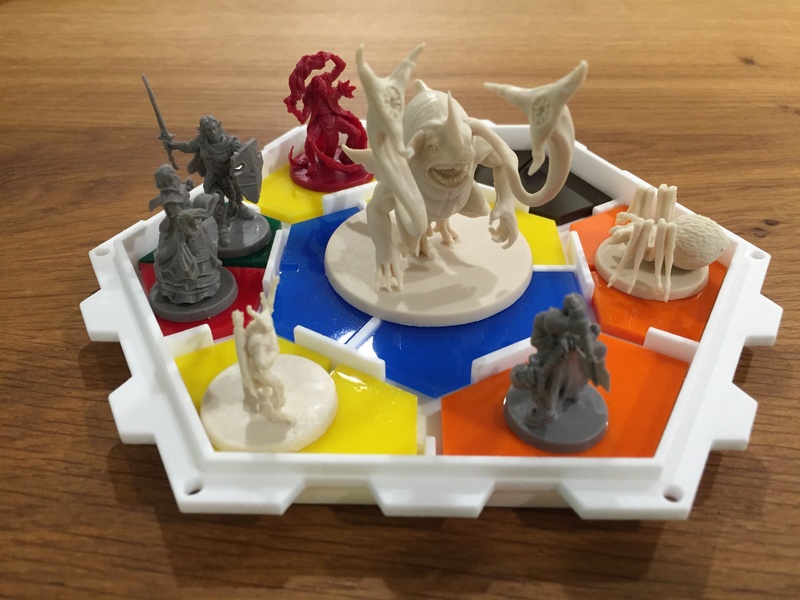 It will walk you through the steps of creating your own original tabletop board games using the PentaHex Board Units and the PentaHex Game Pieces. This final part of the PentaHex Gaming Platform will enable game designers to leverage the PentaHex system to create their own unique game pieces and entire gaming worlds — and do so in record time! We plan to eventually create a community and online platform that will enable PentaHex game developers to submit and manage their creations and earn money from sales of their PentaHex-based games. We may even open source some of our designs and design files. But we are not there yet. Concept PentaHex Worlds Creation Manual Image Coming Soon! 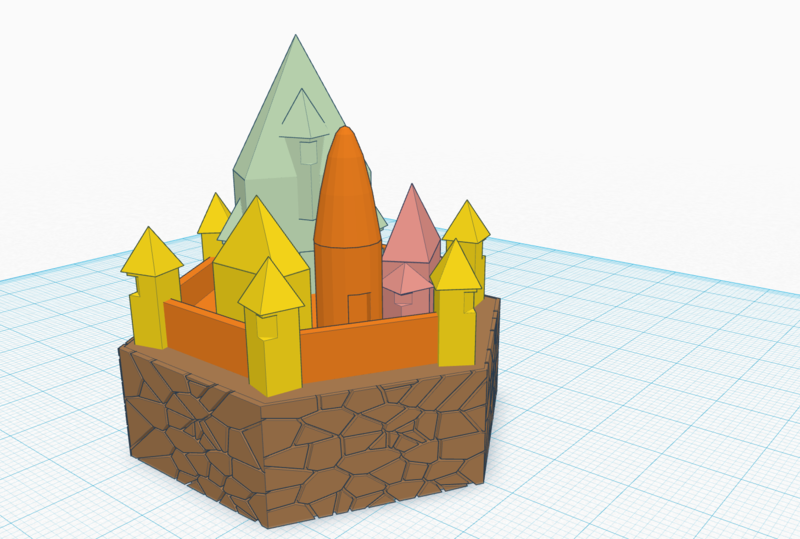 With PentaHex, you can create your own unique game pieces and entire gaming worlds! But Why A New Game Board Paradigm? 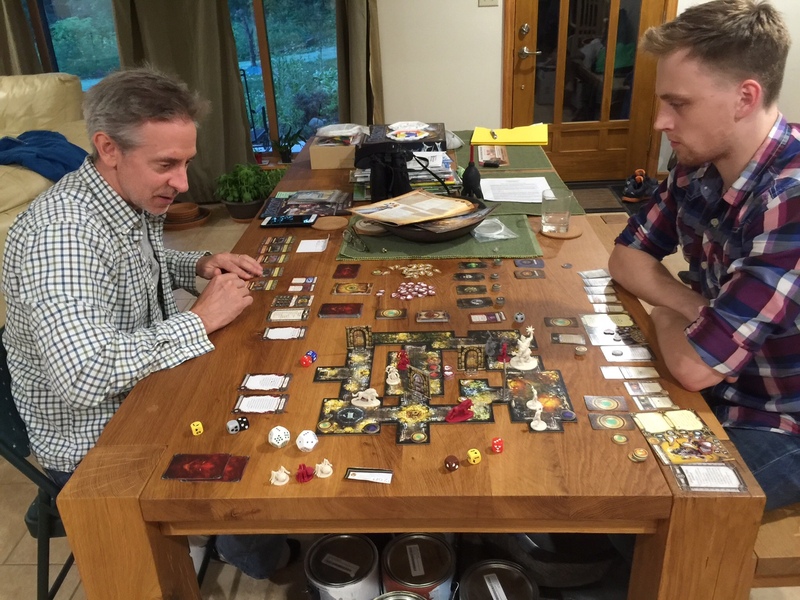 Tabletop games often come with their own physical board or, if they don’t, require a Game Master to create her or his version of a world on paper or some other medium. But once the playing surface is set, the game board usually is not used for any other game. We wanted to create a modular game board unit that would allow the freedom for players and game designers to experience and create any tabletop-based world surface they could envision. Why be limited by the pieces that come in a box? So, using the PentaHex Gaming Platform, you can design a game that has just a few PBUs (even one) as the playing surface. Or, you can scale it up to a massive game board surface with many PBUs connected in whatever configuration you desire. The video to the right demonstrates a massive 64-PBU board! Now if you really want to get wild, you can create a tiered game board, elevating a subset of PBUs above the others (see video to the left). Your gaming dynamics could then dictate what advantage or disadvantage a player has when occupying (playing within) an elevated PBU region. We’re currently working on designing a simple connector that will enable the quick assembly of tiered PentaHex boards. We’ve digitally tested a four-tiered PBU setup — it offers 4 levels of play! But why stop there! Our current iteration of the PentaHex Board Unit (PBU) — Prototype 3 — is a big update in size from Prototype 2. It dwarfs the older prototypes, coming in at a whooping 6.1-inches in diameter (155.1 mm)! That means that our latest PentaHex iteration provides 2.4 times the surface area of prototype 2. There were several reasons we decided to upscale the PBU. The larger size of each game board unit means that each game piece cell is larger too. These larger cells make it possible to accommodate a standard 28 mm to 30 mm RPG figurine. Such RPG figurines usually have a 1-inch round or square base. We encourage you to delve a little deeper and learn how the PentaHex design has been iterated over time. 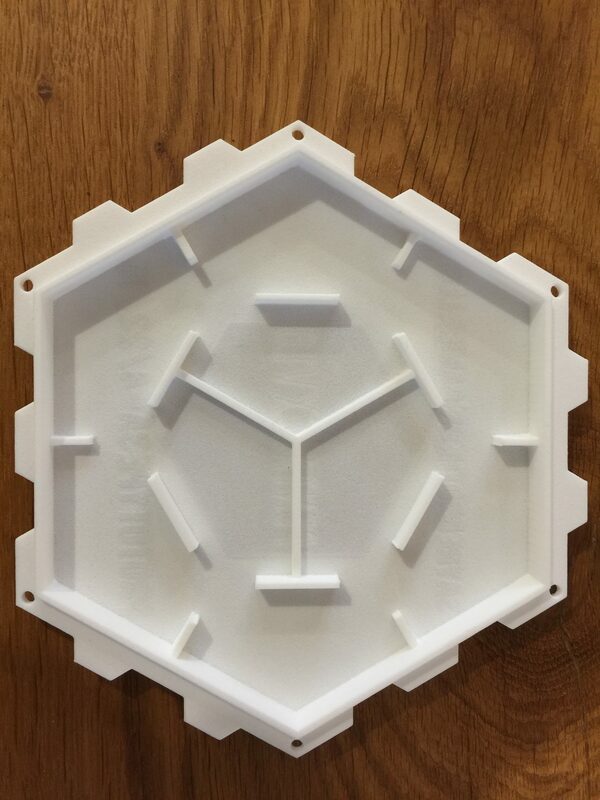 Please see this post, PentaHex Prototype 3 Teaser. Below you’ll find more information than most will probably want to know. But for those of you who love innovation and like to know the details about how a given idea started, and where it is going, here you go! 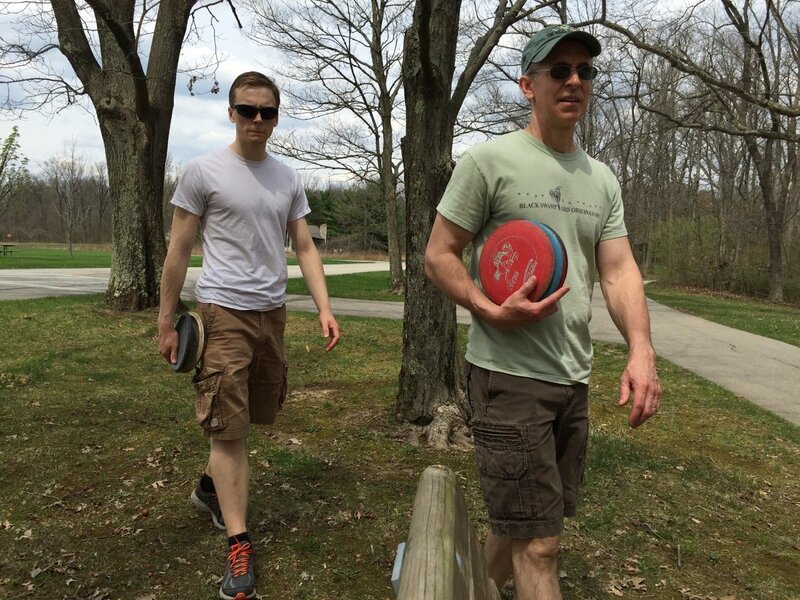 We play all sorts of games from board games, to disc golf, to games we invent on the fly. So starting a gaming company didn’t seem like much of a stretch. In fact, as brothers with a (very) large age difference, we’ve done a number of crazy things together. 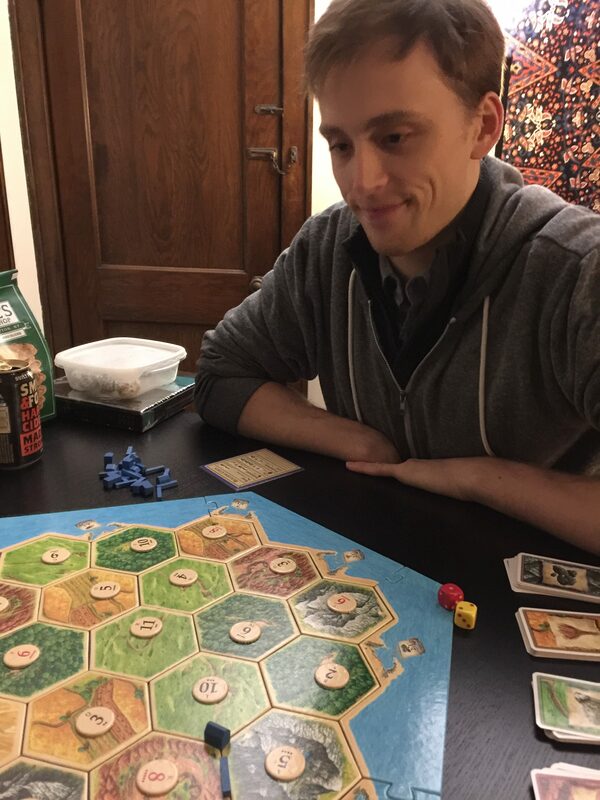 We can’t quite recall how it started, but at some point during a Settlers of Catan game, we started creating additional rules and proposing ways in which the game play could be improved and enhanced. That led to discussions on different configurations for a game board. Eventually we realized that we could create individual board game units that would allow players and board game designers to leverage their own imagination and creativity. They could assemble boards in many shapes and sizes by connecting identical units. Finally, we thought that instead of simply creating a new type of physical game board and then a unique board game utilizing that board, that we should also create a gaming system that would benefit other makers and creators. It would allow them to flex their creative minds and design their own worlds — and do so in record time. 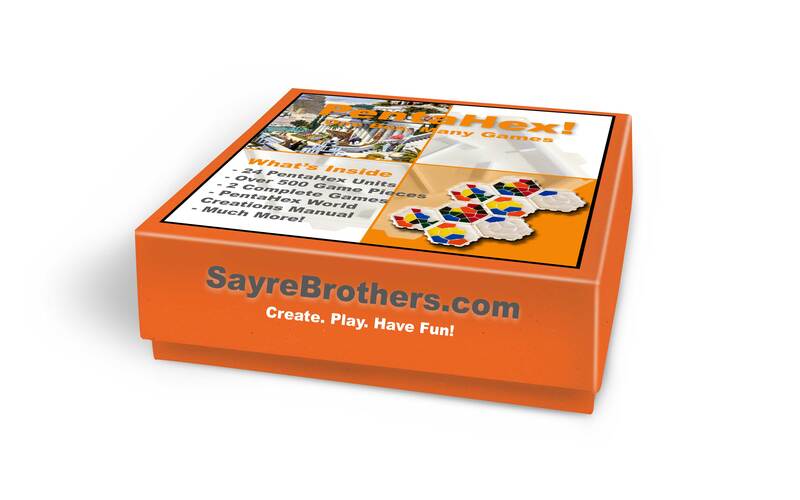 This idea we call the PentaHex Gaming Platform and it led to the formation of Sayre Brothers’ Games! Of course, for those just wanting to play tabletop board games, and who aren’t interested in becoming board game creators, we realized we would need to offer a few complete, unique games using the PentaHex Gaming Platform. That way, they could have fun right out of the box! What’s So Special About the PentaHex Board Unit? 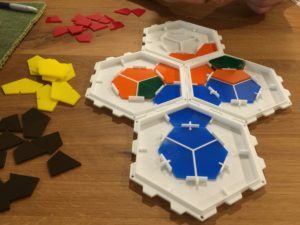 When thinking about the concept of a new game board paradigm, we wanted to veer away from the standard tabletop game board designs — a piece of preprinted cardboard, or a sheet of preprinted paper, or some molded plastic pieces whose functions were predetermined and surfaces preprinted. Instead, we wanted a modular system of identical units that provided a more flexible, blank canvas. 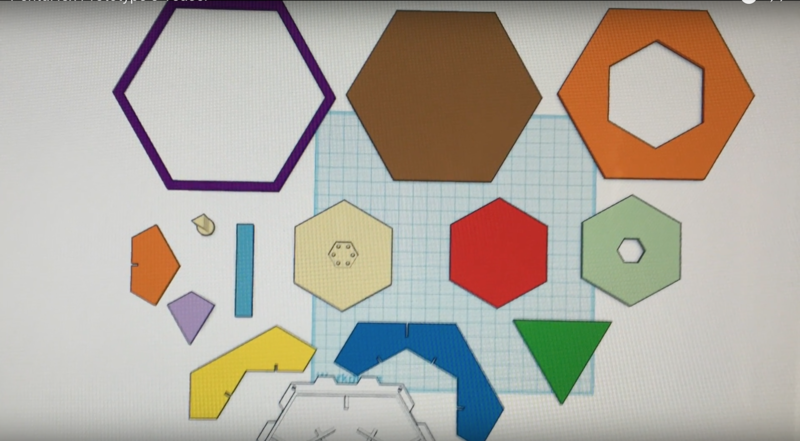 A system that would allow game designers the ability to innovate unique game board shapes and sizes. We settled on a hexagon as the basic game board unit shape. 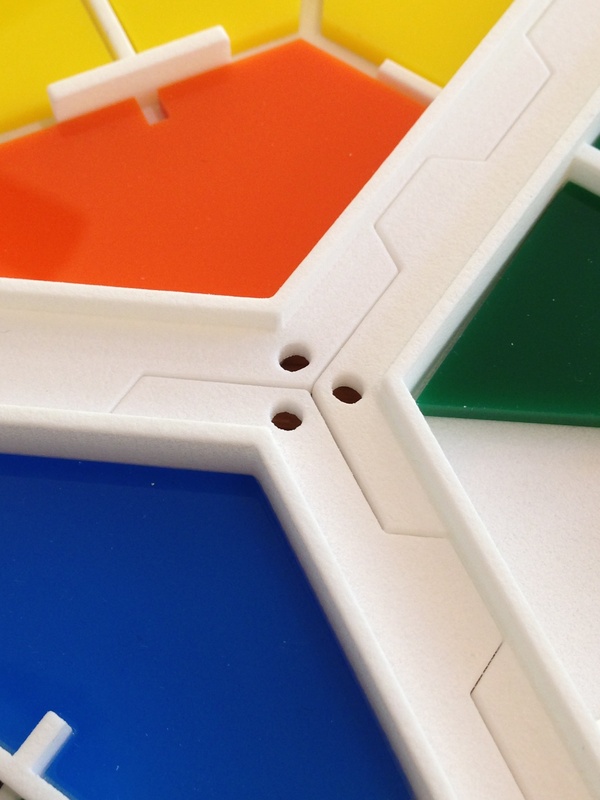 The hexagon has been a favorite for many tabletop game surfaces. But a single hexagon, or more accurately, a simple hexagon was insufficient. So, we took it a step further. We researched various tiling geometries to find a board unit design that itself was comprised of even smaller atomic tiled units. Thus we found a hexagonal shape that is formed by the precise tiling of nine identical, irregular pentagons. It turns out that this arrangement creates two concentric hexagons. 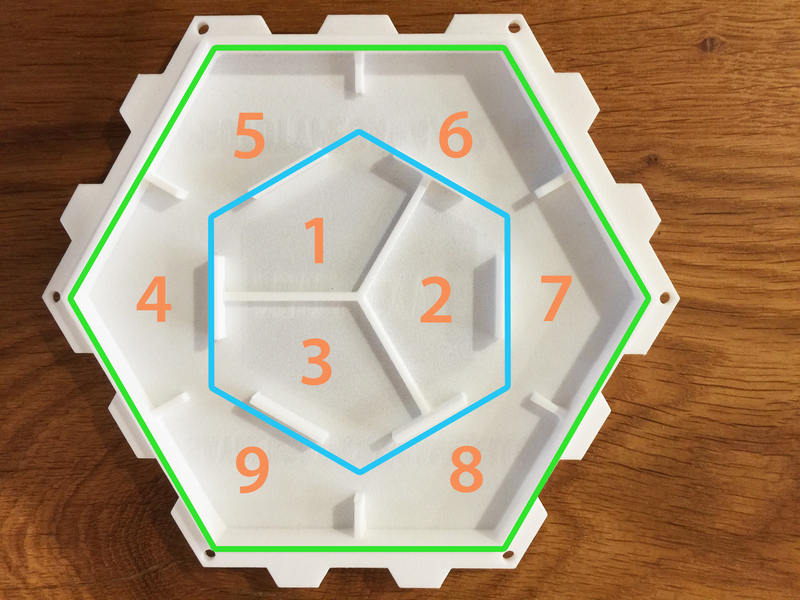 A larger hexagon that is in essence formed by six irregular pentagons creating the perimeter of the game board unit, and a smaller interior hexagon formed by three of the irregular interior pentagons. That is how we came up with the name of PentaHex. 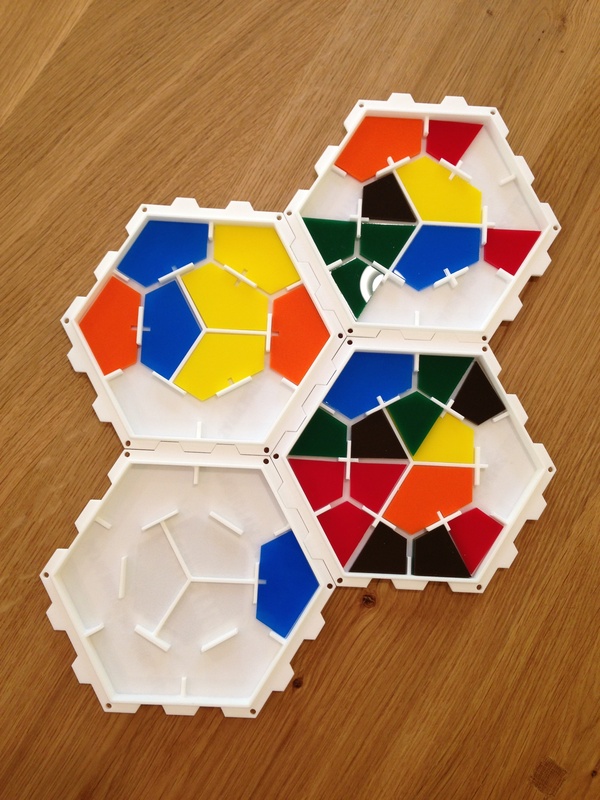 Each individual board game unit is called a PentaHex Board Unit (PBU). A PBU has nine wells, so there are numerous options for game play within each PentaHex Board Unit. Depending on a game’s gaming dynamics, you might use all nine wells, or just the inner and out hexagons, or some combination of fused pentagonal space. 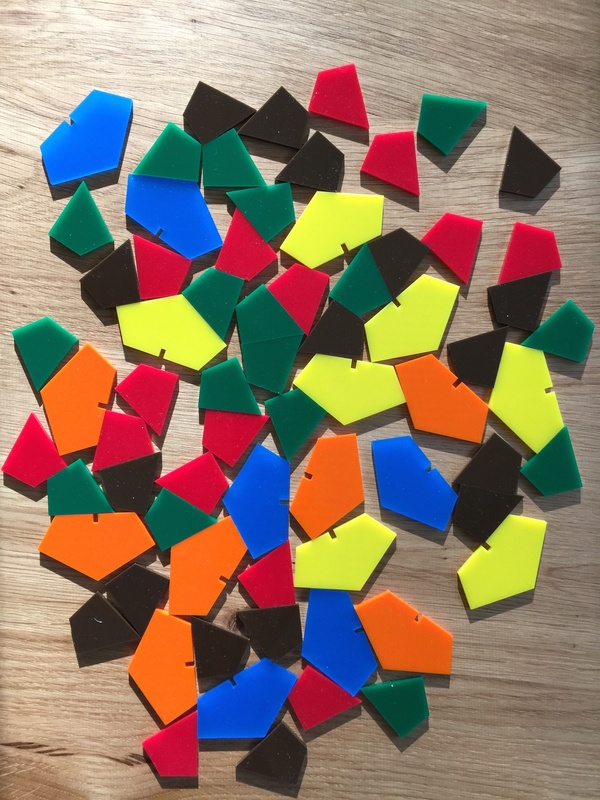 Game pieces have already been prototyped to offer unique shapes to create interesting spaces within each PBU. Game designers do not have to be limited to using just the atomic, irregular pentagonal pieces! And we didn’t want to stop there. We thought, Why should a tabletop game be limited to two dimensions? So we had the idea of turning the traditional two-dimensional nature of most board game boards on their head. We decided that each board game unit (each PBU) would offer playable space in the z-axis. In other words, it would allow for three dimensional (3D) play. The current PentaHex Board Unit allows for three levels of play within each of the outer perimeter cells and two levels of play within the inner three cells! That assumes that a given polygonal game piece is an eighth of an inch (1/8) thick. If you’ve made it this far, congratulations! Our journey has just began. But to get us to the point where we can share our creation with the tabletop gaming world, we need your help. So we’ve launched a Patreon. Please see our Support Us On Patreon page to learn how you can help support our efforts to bring the PentaHex Gaming Platform to fruition!